I spent five summers from 1955 to 1959 playing baseball on the McIlroy Bank team in the Fayetteville (AR) Sherman Lollar Little League (LL). 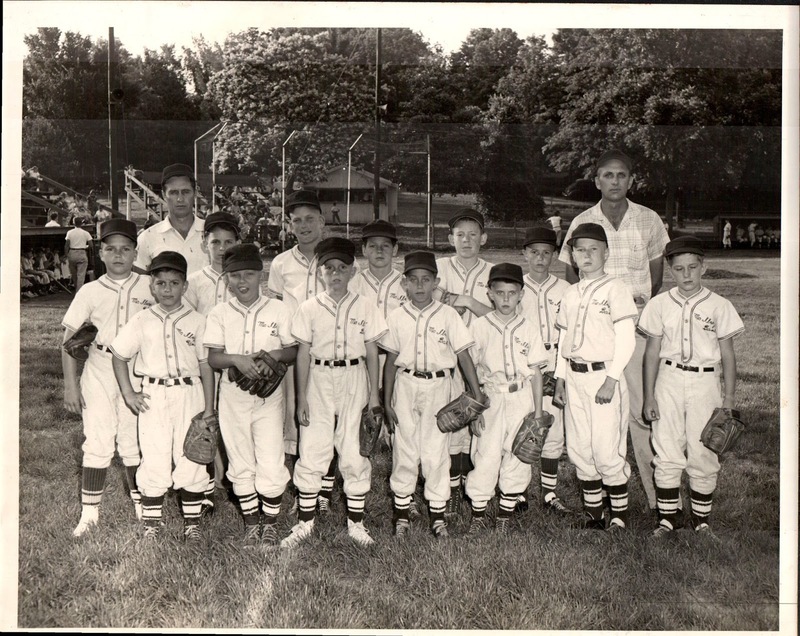 During my first year in LL, I was only eight years old and had never played on an organized team. 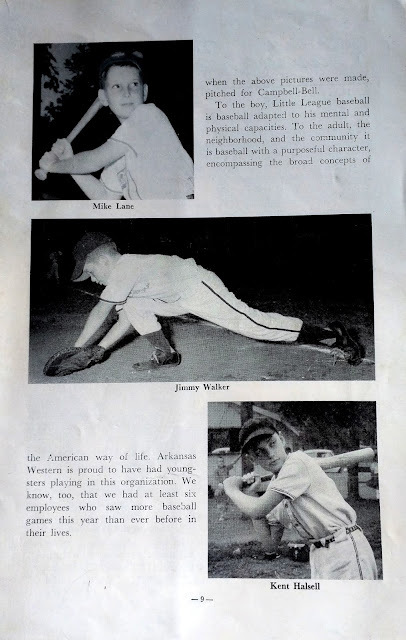 Of course, I was not the only novice, but was part of the first wave of Baby Boomers, whose numbers had inundated local schools two years earlier and in 1955 started to flood the baseball leagues. Then, as now, LL was for kids 12 years old or younger. Its games were played on fields with smaller dimensions than regular baseball fields. For example, the distance between bases was 60 feet instead of 90 feet for standard parks. The pitching rubber was only 46 feet from home plate, instead of the standard 60’ 6”. Also, fences in LL parks were typically 50 to 100 feet less distant from home plate than standard parks. The sponsor of my LL team, McIlroy Bank, was locally owned, located in a building on the north side of Fayetteville’s Square. The sponsors of other teams were also local businesses or local franchises of national corporations, including (in 1959) Cravens & Co., Ricketts Drug Store, Goff-McNair Motors, Ben Franklin, Coca-Cola, Fairway Groceries, and Campbell-Bell. 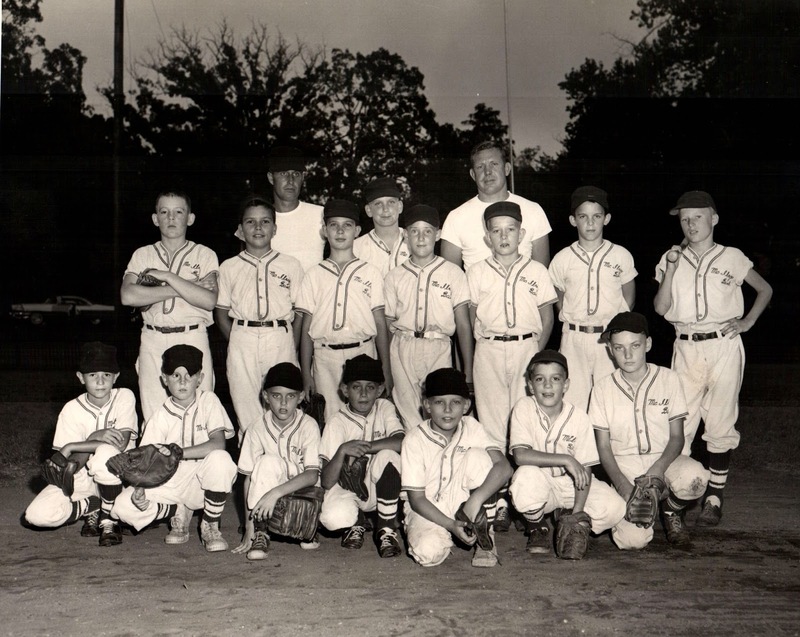 Each team had 15 players on its roster, a total of 120 boys. 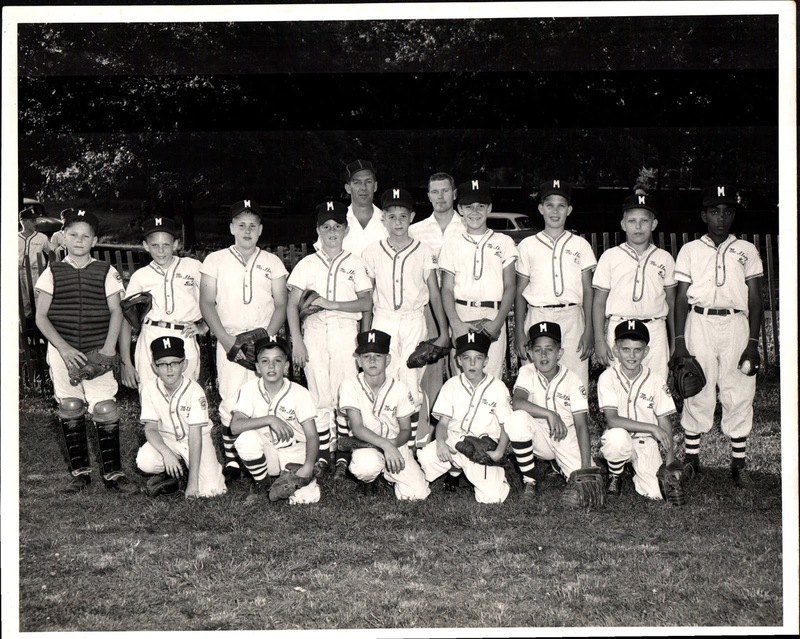 In addition to the eight LL teams, another eight teams of 8-to-12-year-old boys played in a second league, the City Park League. 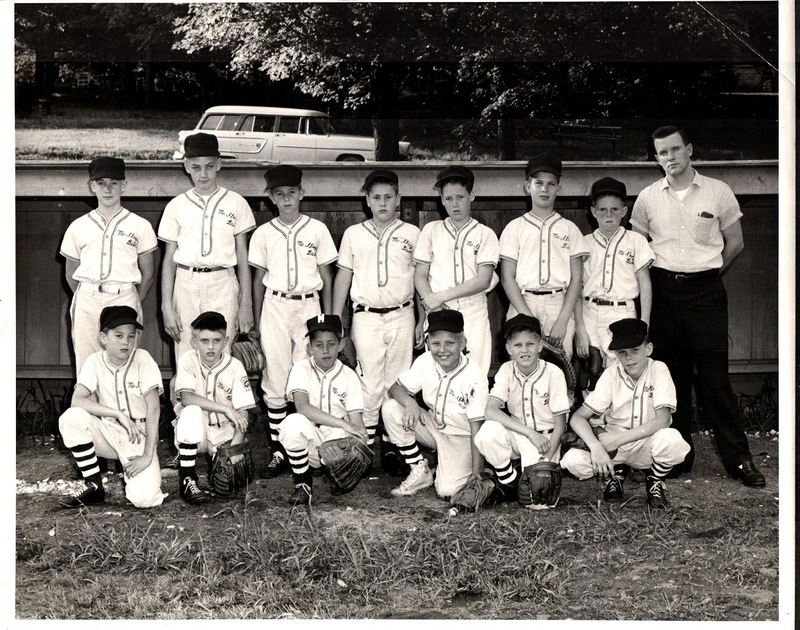 The kids on these teams had not been selected or for some reason were unable to play on a Little League team. These teams were did not have sponsors, and they played their games during the day. The coaches of these teams were usually young guys who were just two or three years older than the players. 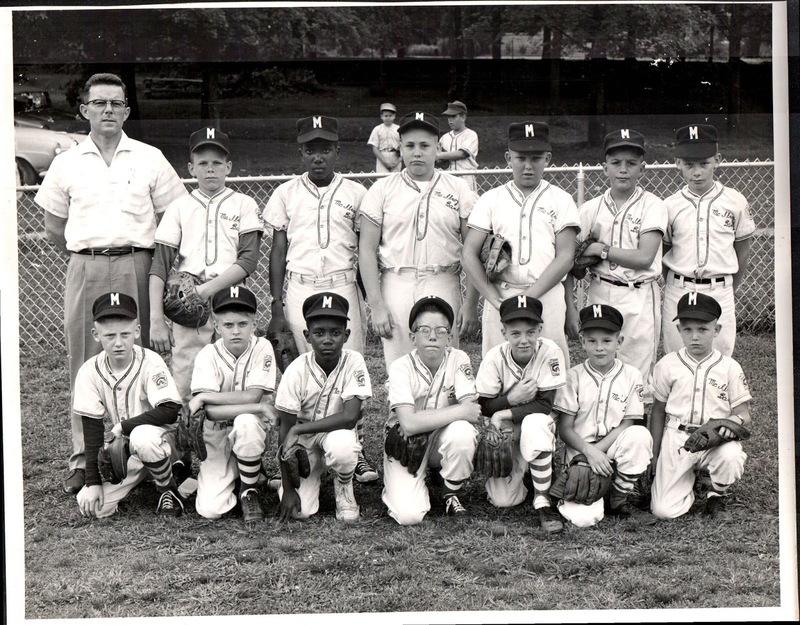 In 1959, each of the eight City Park League teams had 19 players listed on its roster, a total of 152 boys. 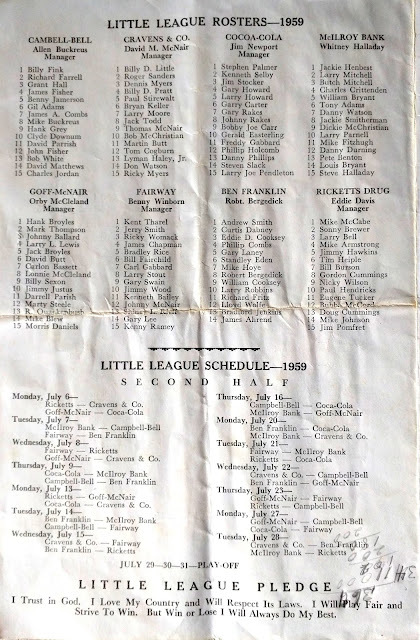 In all, 272 boys are listed in the 1959 program as members of either a Little League or City Park League team. 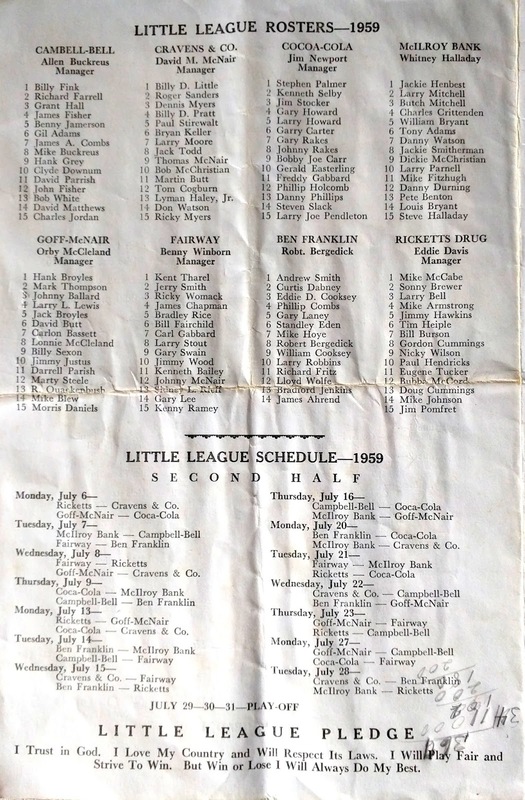 The following is the program for the 1959 baseball season with the schedules and the list of players on the Little League and City Park League teams. (The numbers in the margin are my dad's calculation of my batting average at different times during the season). Looking at photographs of the five McIlroy Bank teams from 1955 to 1959, I can remember most of my teammates, but have no idea what positions they played or how good they were. The pictures document that Tony Adams and Mike Fitzhugh were my teammates for all five years of my LL career. Tony lived a few blocks to the west of me and went to Jefferson Elementary. Mike lived on the other side of town. Ronnie Cole, who lived a block down from me on Sixth Street, was a teammate from 1956 to 1958, and his father was a co-coach in 1956. Steve Halliday was a teammate on the last three teams (1957-1959). His dad was coach of the 1959 team. Later, Steve and I played football together on the Hillcrest Junior High team and two years at FHS. Roy Skelton, Royce Robertson, and Richard Parrott were my teammates from 1955 to 1958. I knew Roy pretty well, but do not remember much about Royce or Richard. Pete Benton was a teammate from 1956 to 1959. Pete was a heavy-set lefthander who was a power hitter. He was also a funny guy and I enjoyed being his teammate. 1955 McIlroy Bank Little League team. Front row (from left): Mike Fitzhugh, Danny Durning, Richard Parrot, Roy Skelton Tony Adams, Kenny Terry, Gene Fitzhugh. Second Row: Gerald Ezell, Bobby Brooks, J.D. McConnell, ?, Charles Ludwick, Royce Robertson. Two adults: Coaches Adams and X. 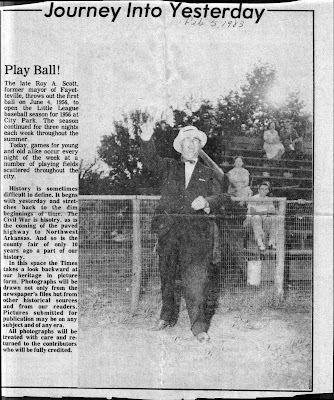 Other players that I clearly remember are Kenny Terry (1955 and 1956), Dickie McChristian (1958), Larry Shafer (1958), Delmer Baggett (1957), Jackie Smitherman (1959) and Danny Watson (1957), all of whom lived in my neck of the South Fayetteville woods. 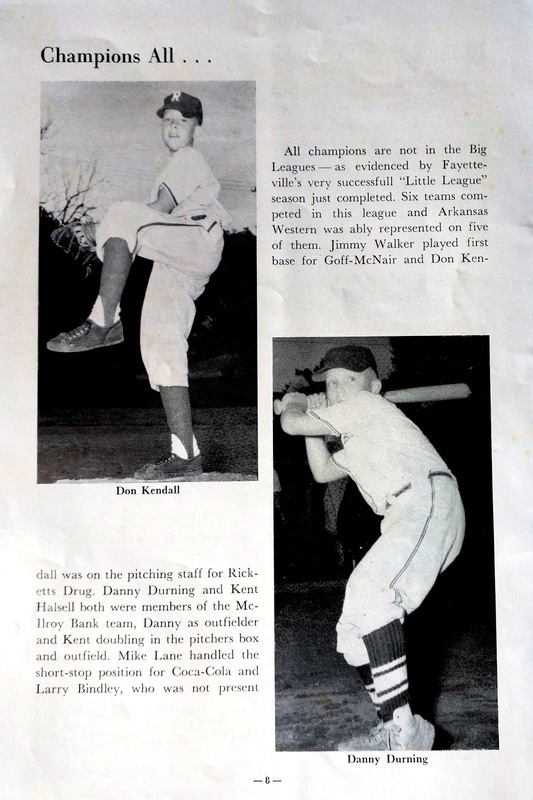 Also, Jim Nail (1958) and Larry Parnell (1959), with whom I played on other sports teams, were teammates. In addition, I recall Gene Fitzhugh (1955) and Kent Haskell (1956-58) as good teammates. The pictures of the 1958 and 1959 teams show that the team was integrated. Louis Bryant was on the 1958 team, and he and his brother Willie Bryant were on the 1959 team. I do not recall any controversy about the integration of Fayetteville’s Little League, though probably there was some. It was integrated a couple of years before the city’s elementary schools were. In later years, when I was playing with Louis on the Fayetteville High School Basketball team, he and Robert Wilks were the first black players to play in the state basketball tournament, and our FHS team was among the first integrated teams to play in such cities as Hot Springs, El Dorado, and Texarkana. All of my LL teams had good coaches and I liked all of them. Tony Adams’ dad coached the team during the first two years. After that Jerry Crittenden, Charles Crittenden’s brother, was coach. (Charlie and I went to high school together. He was on the 1959 team.) The fourth-year coach I did not remember very well (I think his name was George McConnell.) He was assisted by James Earle Harris, who later was the assistant coach of the Babe Ruth League team for which I played). During the final season, in 1959, Steve Halliday’s dad was coach. At the time, he was Dean of Men at the University of Arkansas. In retrospect, I understand more fully that each of these men volunteered lots of time and underwent lots of bother to coach the team. I appreciate what they did for us kids. No doubt, my five-year career with McIlroy Bank was filled with exhilarating moments of accomplishments and mournful moments of failure. It had, I’m sure, its highs and lows. We likely won some tight games and lost some blowouts. I probably hit a home run or two; just as likely I probably made errors at critical times in different games. I have to assume all of these things because I can recall little about playing Little League baseball. In fact, I remember almost nothing of the 60+ games I played in during my five years in the league. I don’t remember winning a game nor do I recall losing a game. Did my teams have winning records or were we losers? Did we play in championship games? I have no idea. I’m not even sure what position(s) I usually played during my five-year LL career, probably third base or left field. I know that I pitched the last two or three years I played, but don’t remember any of those games. 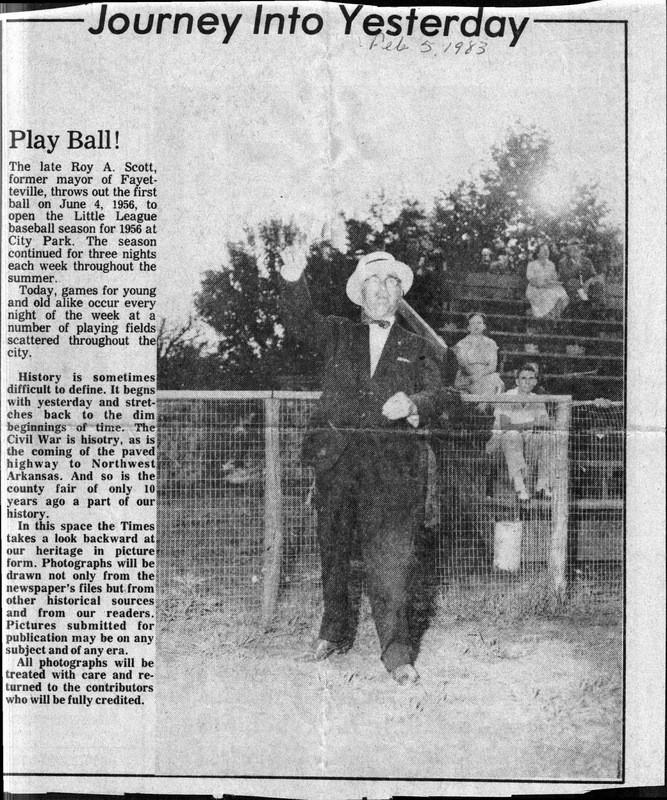 (Apparently I was not a very good pitcher because Bubba McCord, who played on Ricketts Drug Store team, claims that he hit his first little league home run off of me. I will keep rejecting that claim until he can prove it). My main memories of my LL career are diffuse but deep. They are more recollections of surroundings and feelings rather than specific events. I can still see the details of the field, its bare infield, the fenced-in dugouts, the stands populated by people I knew, and the manual scoreboard outside the center field fence. Also I can recall the excitement, tension, and concentration of playing in LL games. Above all, even without memories of what exactly happened during those five years, I know that LL baseball was both fun and important. My summers were all about playing baseball and LL was the center of that activity. Some of my most pleasant memories are of the preparation for new LL seasons. A highlight of each year was getting the McIlroy Bank uniform and a new dark-blue baseball cap that I would wear that year. It was a challenge to properly break in the hat. I preferred the cap’s bill to have a smooth oval shape and was dismayed by the uncouth guys who turned down the corners of their bills. To get the proper oval, I had to attend carefully to molding it for several days. Along with getting a uniform and new hat at the beginning of the year, my parents would usually buy me new shoes to wear with the uniform (no spikes allowed in little league). Looking at the pictures from my five LL years, it appears that I usually wore high-top Keds. Lots of other kids had actual LL baseball shoes, black with plastic bumps on the bottom. Every two years or so, my dad would take me to Ken’s Sporting Goods to get a new baseball glove. To prepare for that exciting store visit, I had go to Ken’s several times in advance to check out the store’s collection of gloves. Most of the gloves in Ken’s store were endorsed by major league baseball players, and I wanted my new glove to be just like one used by a favorite St. Louis Cardinal player, maybe Stan Musial or Kenny Boyer or Vinegar Bend Mizell. I would try on the gloves until I had decided which one had just the right feel and endorsement. When I got the glove, I took special care to mold it to my hand so that it would fit just right. That took some work and special oil. Typically, I would use only three of the glove’s four fingers, putting my fore- and middle fingers into the glove’s third finger, leaving its fourth finger, next to the web, free. With such a configuration, I was less likely to feel the sting of a hard-thrown ball. Some kids put their forefinger outside of the glove, on the back strap. I never understood that. I always wanted to buy my own baseball bat, preferably a Stan Musial model, to take to the plate, but, alas, experience had shown that was not a good idea, and my parents were not ones to throw away money on such things. Often if a kid bought a bat, other kids would beg him to use it during a game and, inevitably, one break it (wooden bats did not have a long life expectancy). Then, he (or his parents) would not pay for the broken bat and hard feelings would follow. If another kid did not break the bat, the owner would usually break it himself not long after buying it. Instead of using our own, most LL players hit with the bats provided by each team. These wooden bats were carried around in an oblong bat bag that also contained scuffed balls for warmups and batting practice, batting helmets, and catcher’s gear. The coach was responsible not only for coaching, but also for managing the bat bag and its precious contents, which were purchased by team sponsors, who also bought the uniforms and hats for the players. Some sponsors seemed more generous than others. My team wore the same uniforms during all five years I was playing on it. ●In May 1955, I was one of a hoard of young boys who tried out for a Little League team. The tryout was held at the old Fairgrounds Park, which seemed huge to all of us kids. The coaches set up different stations to test our ability to field a ground ball, catch a fly ball, run, and hit. I was excited and scared, but was sure I was going to get on a team because Tony Adam’s dad, coach of McIlroy Bank, had already hit me some grounders and flies before the tryout. He had told my dad that I was a natural outfielder. ●Sometime during my first or second year, I decided that I wanted to try to be a catcher. After begging several times, the coach let me catch during batting practice. After about five minutes of squatting behind batters, I no longer wanted to be a catcher. ●For some reason, we were playing a game against a Springdale team. My cousin Russell was on the opposing team. He was on first base and I was playing second (I played second base?). A ground ball was hit to me. As I bent over to field it, he ran over me, knocking me down. The ball went past me. I was mad and thought that was unfair, but felt better when my cousin was called out for interference (I rule I did not know at the time). ●I was terrified when I had to hit when my cousin Justin Daniel was pitching. He was a giant among pygmies who threw faster than anyone should. He seemed to be throwing from ten feet away rather than 46 feet. I kept thinking: What if he hits me in the head, or anywhere? Maybe he will kill me! (O.K., the league required helmets, but still…). Also, I was impressed with some of the home runs Justin hit. They traveled not only over the left field fence, but over North Park Avenue, hitting the apartment building on the other side on the street. (Some home runs hit in the following years by Lloyd Wolfe and Charley Jordan were also awesome. They both hit left handed, and sometimes hit balls that cleared not only the right field ball-park fence, but also the swimming pool fence beyond it, ending up in the water. ●Some years, we had cool aid and a snack after the game (if it was the first game of the night). Win or lose, we would find a concrete table in the City Park and eat something one of the mothers had prepared. 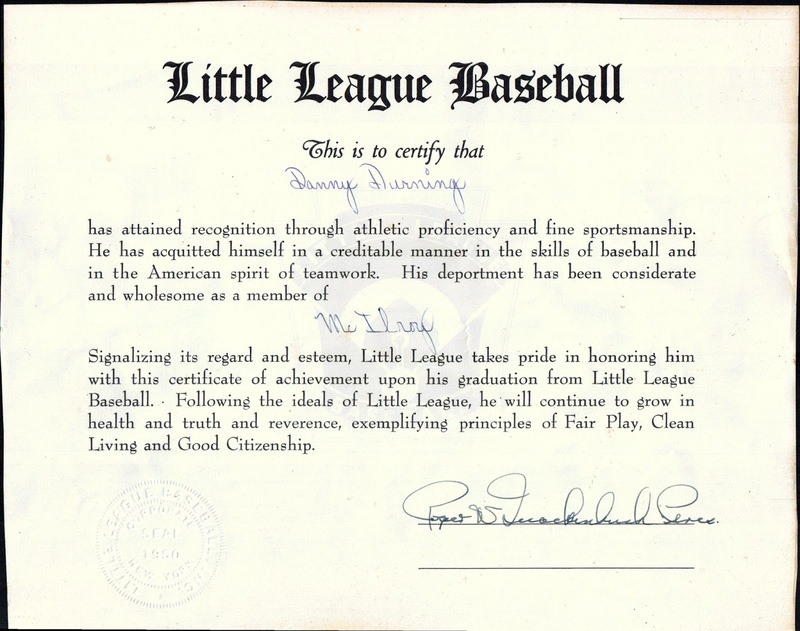 Despite the lack of specific memories of my time as a little league player, I judge my LL career a success. Although I lack information about how well I did as a pitcher and hitter, I know that I learned much from the experience about getting along with other kids, having the discipline to show up for practice and games, learning to play on a team, and learning to compete and do my best. I think playing in LL gave me confidence that helped in future years. On the last night of my LL career, after I had just finished my last little league game, I was sad. I was lying down in the back seat of the Plymouth as my dad drove south down College Avenue toward home; my mother sat next to him. I stared at the car’s ceiling and felt unsettled by things that were happening beyond my control. After five years of playing in Little League, I could never play another LL game. That thought bothered me as did the uncertainty of the future: what would it be like to play in the Babe Ruth League on a full-sized field? Could I do it? Would I be good enough? As the car pulled into the driveway on Sixth Street, I was thinking how much I would miss playing little league baseball. I didn’t really want things to change. I was being forced into something I did not want to do. As I pondered the future, I was glum. Then a thought dawned on me: in the coming year I would get to wear baseball shoes with real spikes and most certainly would get a new, larger baseball glove. With that realization, my mood brightened and I slept peacefully my first night as an ex-Little Leaguer.